Chris Dempsey, from Middleton, Idaho, is the author of Winter Horses, a chapbook of poetry. He has been the recipient of a poetry fellowship from the Idaho Commission on the Arts. His poems and essays have appeared in English Journal, Inland, Talking River Review, Willow Springs, High Desert Journal, Idaho Arts Quarterly, Boise Magazine, Voices West, and other publications. He earned his master’s degree in Education from Boise State University. He is a National Board Certified Teacher and has been Idaho Council of Teachers of English Language Arts Teacher of the Year. For thirty years, Chris has taught high school English; he presently teaches and coaches at Eagle High School. Chris lives with his wife, Cindy, on eight acres where they have planted nearly a hundred trees, shrubs, and perennials to attract birds and other wildlife. In his free time, he can be found in the remote corners of Idaho and Oregon pursuing the wily chukar partridge with his two wirehaired pointers. Dwayne Blackaller has worked as a professional actor, teacher, director and play deviser since 1995. He is the co-creator of the devised pieces The Physics of Regret, Destinopolis, and The Acheri, and the author of the plays re/fraction, The Science of Fiction, Air Heart, andOrofino. He is the co-writer of The Uncanny Valley, Narwhal! Unicorn Of The Sea, A Nighttime Survival Guide, and Rabbit/Moon, with Matthew Cameron Clark, and Maggie Lumiere and The Ghost Train, with Tracy Sunderland. He has a passion for teaching young performers and has worked as an acting teacher for The Idaho Shakespeare Festival, Eagle Performing Arts Center, College of Idaho, and the Ohio State University. He was also a puppeteer, sword fighter, and stilt-walker in Las Vegas. Dwayne has trained with Anne Bogart’s SITI Company in New York, and specializes in teaching Viewpoints and Suzuki training for actors. He is now the Associate Artistic Director at Boise Contemporary Theater where he created BCT Theater Lab, a program for youth to find their voices and create new plays. Dwayne earned his MFA in acting at the Ohio State University with a focus on movement and devising new work. Nicole LeFavour, has an MFA in creative writing from the University of Montana and a bachelor’s degree from the University of California Berkeley in the evolution of cognition. She lives in Boise and teaches creative writing at The Cabin, and has represented the state in the National Slam Poetry competition. A life-long human rights advocate, she served in the Idaho Legislature for eight years. In 2012, Nicole finished a novel about a dragon and is presently working on a memoir. She writes essays, journalism, creative non-fiction, poems and slam poetry. "As a young person, I lived on an Idaho ranch at the edge of the Frank Church wilderness. Nothing inspires me to write more than being in the wild. It is not only what is around me, the beauty, or the intricate lives of the plants and animals, but what of myself I find there." Malia Collins grew up in Hawaii and left home for the wilds of Wisconsin where she received her degree in creative writing and journalism from Beloit College. She spent a few years traveling and living abroad until going back home to Kailua, Oahu, to get her Master’s in Literature at the University of Hawaii at Manoa. After finishing her degree, she moved to Grenoble, France, on a Rotary ambassadorial scholarship to study French Literature at L’Universite Stendhal. It was there that she fell in love with snow and skiing. Shortly after returning to the States, she made a three-day stop in Boise to say hello to her grandparents. That was in 1999, and she’s been here ever since. Malia has published short stories in a number of literary magazines, has two Hawaiian children’s books, and is currently working on a guide to Hawaiian culture as well as a novel. She loves to swim in the ocean, walk Kailua Beach, and hike up Table Rock, particularly at sunrise. She lives in Boise with her husband and two children. She is an assistant professor in the English Department at the College of Western Idaho. ​Jessica Holmes is the co-creator and driving force behind Story Story Night, a popular live storytelling program based in Boise. At Harriman, she coaches students for StoryStoryStory, a dynamic workshop and presentation showing how to hone the power of true stories for the page and the stage. In her professional life, she works as a freelance copywriter for ad agencies and businesses in Idaho and beyond. When she has free time, she backpacks in the vast wildnerness beyond city limits. She holds a bachelor’s degree in English Literature from College of Idaho. ​Daniel Hidalgo is the educational director of the Idaho Art Lab in St. Anthony where he teaches ceramics, pottery, sculpture, painting and drawing. He is also a painting instructor for the Yellowstone Association Institute and one of the artists behind Dung and Dunger Paper Art Studios. Growing up in Pocatello, Idaho Falls and Blackfoot, Daniel’s inspiration for his work comes from his surroundings in Eastern Idaho. Kara Hidalgo has her degree in marketing from BSU and is the co-founder of the not-for-profit makerspace, Idaho Art Lab. She and her husband, Daniel, also lead field trips around the region and in Yellowstone National Park for photographers and painters. At the Lab she teaches art, lapidary, animation, digital photography and photo editing as well as large format photography and how to use the photography darkroom. Kara's lifelong adventure of taking pictures, painting and writing poetry began in junior high. She was a member of Boise's "Between the Lines Poetry Society", has had photography published in Sunset Magazine and trade magazines and her paintings have exhibited at the Art Museum of Eastern Idaho and at Yellowstone Teton Gallery of Art. Allen Dale graduated from Northwest Nazarene College (now University) in 1987. He taught biology in and out of the classroom since that time. The phrase that best describes him is, if it starts with a “B” and flies he is passionate about it. Allen will be leading nature hikes and looking for bats, birds, and butterflies. Heidi Hughes is a graduate from Lewis Clark State College. She is planning to start her masters in Communications in the near future and enjoys camping in Yellowstone, working for the City of Boise Park and Recreation's Kid City program and being able to wake up all of the campers by singing Disney melodies. Tristan Arnold attended Writers at Harriman for two summers before becoming a proctor. He will graduate in the spring from Dickinson College in Pennsylvania where he will receive a degree in international studies. He was a student delegate at the 2017 Air Force Academy Assembly and will be a delegate at the 2018 Naval Academy Foreign Affairs Conference. Tristan is a graduate of Boise High School and enjoys all manner of learning, as well as hiking and backpacking in his beloved Idaho mountains. Hailey Akerman is a graduate of Nampa Senior High School. She enjoys reading and writing young adult fiction, drawing, playing her clarinet, and going out for coffee at the Flying M. She loves watching cartoons and listening to all kinds of music, ranging from indie to classical to K-pop. She is a student at Northwest Nazarene University majoring in studio art and minoring in graphic design. ​Rick Just is the director of Writers at Harriman. He holds an MPA from Boise State University. Rick worked for the Idaho Department of Parks and Recreation for 30 years. 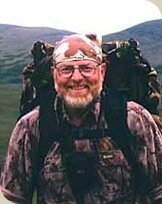 He currently serves as president of Friends of Idaho State Parks and is on the board of the Idaho Writers Guild. He has published six novels and several non-fiction books. His latest book is Fearless--Farris Lind, the Man Behind the Skunk. Rick writes a daily Idaho history blog called Speaking of Idaho that has more than 5,000 followers.